The most recent SEO news aggregator I’ve been using is a new SEO channel from Original Signal that is not unlike popurls. It aggregates feeds from the likes of Search Engine Land, Search Engine Watch and our own Online Marketing Blog. You can subscribe to the aggregated RSS feed or if you like visiting the web pages like I do, then there are some useful tools like being able to physically re-arrange the site feeds on the page and sorting the most popular posts of the entire category by day, week or month. You can also get code to syndicate the feed to your site or tap into the mobile version. The next SEO news aggregator is the one that started it all for me in terms of tracking multiple SEO blogs in one spot. 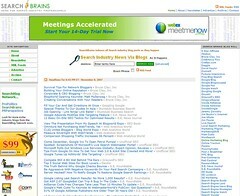 This tool is called Search Brains and is run by iEntry, the folks who publish WebProNews. There are no user enabled features, but the interface is interesting in that it grabs posts at time intervals throughout the day and posts them in clusters. It used to update much more often than it does now but still handy. NewsNow is a UK based news aggregation service. The interface is similar to Search Brains in that it pulls feeds at certain time intervals during the day and segments them that way. What’s different is that they pull news from a mixture of mainstream media sites as well as blogs. 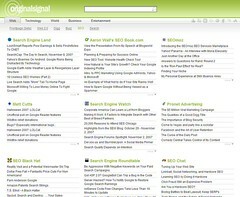 Before Original Signal published their SEO channel, the only other popurls-style interface was SEOmash. This aggregator pulls in feeds from the usual suspects as well as SEObook, Search Engine Roundtable as well as from forums, affiliate sites and of course, own proud little Online Marketing Blog. The site that really uncovers some gems of content, is of course Sphinn. A forum/social news/networking amalgamation, Sphinn gives us those layers of editorial filtering via user submitted stories, voting and whatever it is the moderators are doing. 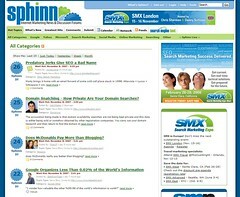 Some stories that go hot can be a bit sensational, but overall, there’s more value coming out of Sphinn as far as great search marketing content than I’ve seen in one place in a very long time. If you know of some interesting and productive search marketing news aggregators, please share in the comments. Damn you Lee! I was so going to do this! Heh. Glad you did. 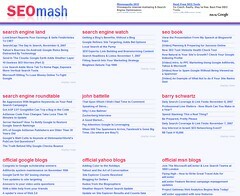 I wanted to feature Original Signal but couldn’t remember the name of SEO Mash, which deserved attention too. Was waiting for it to come to me, and now I don’t have to 🙂 Will point over at you tomorrow. I’ve away liked Original Signal, now its even better. Especially since it has the capability of allowing me to move your feed to the top row. I ran into SEOmash the other day but I have not seen Search Brains. I have tried pulling your opml file into many different news feed readers. If they worked…it was over kill. My actual nick is Lee too! That was a good post. Thanks for sharing the resources. I also was getting overwhelmed with trying to keep up with SEO, so I adopted a two part method. One is to subscribe in my RSS feed reader to the ten blogs on SEO that I find most useful (the usual suspects). Second is that I ask an agent to look out for anything else that might be interesting. The agent I use is Daily SearchCap from Search Engine Land. Thanks for pointing us to these other resources! These are excellent resources! 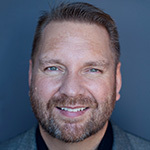 I have a tough time keeping up with the growing amount of SEO blogs, but with these suggestions, I think I may now more feasibly be able to stay on top of those blogs that interest me most. This post might make a good addition to our “Powerful Posts of 2007” e-book we’re putting together at Create Business Growth. Just leave us a comment in today’s post if you would like this or another post included. Thanks for the info. I just discovered Original Signal the other day and I am interested in checking out a few more of the sites you mentioned here. My feed reader is getting a bit overwhelming to go through now and I feel that I sometimes miss some great stuff. Thanks for this posting! It’ll help me with optimizing my own site for SEO!